As part of your spring cleaning, you should clean out your kitchen cabinets and pantry. I try to do mine this week, so that my donations are ready for the “Stamp Out Hunger” food drive on Saturday, May 11, 2013. Interested in donating? 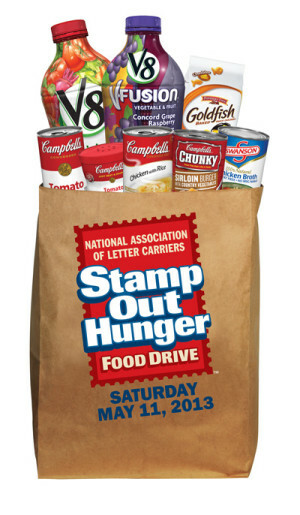 Just leave your non-perishable items in a bag at your mailbox on Saturday, May 11, 2013. Your letter carrier will pick it up and deliver it to a food bank, soup kitchen or shelter. Isn’t this great? It’s a way to donate to those in need, and have your donations picked up at your mailbox. This entry was posted in Maintenance, Meals and tagged clean out pantry, cleaning your pantry, donate food, stamp out hunger on May 8, 2013 by Running A Household.